to Hamilton and Calgary season ticket holders. No mention of it, but I am guessing the same number of tickets as last year are available, 20,725. Prices are up $10/ticket across the board this year, but get yours fast, they are still not expected to last long like last year. Update: The touchdownatlantic.ca site is no more, so here is the Stade Moncton Stadium seating plan from 2010. 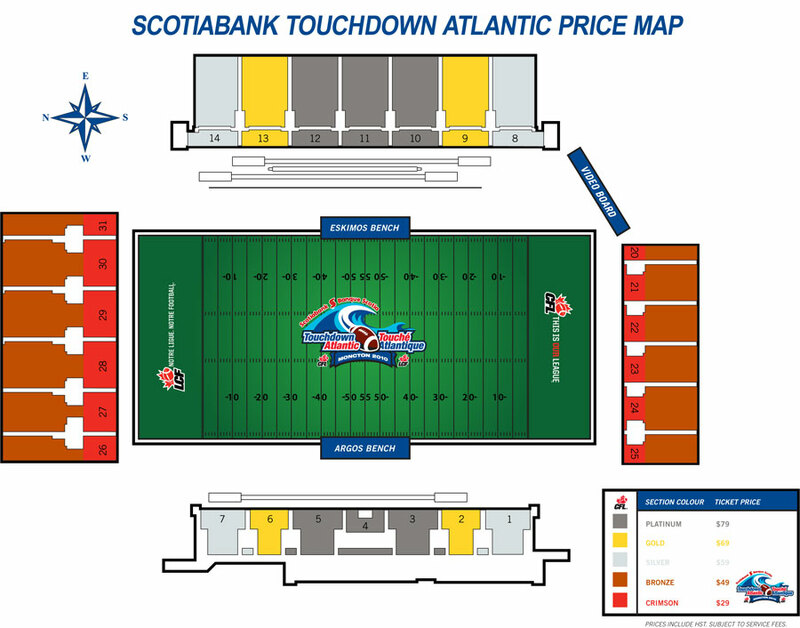 Update May 8th: The Touchdown Atlantic page has the 2011 seating plan. With an accompanying video to outline the vision of a covered stadium surrounded by commercial and residential development, this plan looks suspiciously similar to the last one, though this time developers are expected to contribute the funding shortfall. I guess the citizens of Regina will continue to take the subway to stadium events. No subway? Well, the L-Train then. I would describe three of the changes (instant replay, punting out of bounds, illegal participation) as tweaks to correct deficiencies based on experience in interpretation and the fourth (eliminating blocking below the waist on receptions) for player safety. In time, blocking below the waist may be eliminated altogether. No, not the brand of smokies at football games, but settlement of 11 of 14 challenges to the project. Hard to see how the remaining challengers have a leg to stand on when all the local interested parties have signed off on these concessions in the plan. The Saskatchewan Roughriders exceeded the 2010 CFL SEC of the Salary Management System by $26,677. The team was fined $26,677 in accordance with the punishment provisions set out in the SMS. A $409,000 profit after revenue increases in all major areas and operating expenses reduction. The full report shows the revenue and expense changes over the last five years. League revenue climbed 6.7% year-over-year as it approaches $2 million per team. The only way change can occur is with the help of the players. And it sounds like the player reps think change is a good idea. Fans that complain should get a sample of the head-rattling shots they say will be missed from the game.